Fri., June 8, 2018, 5:30 a.m. It is, however you look at it, a tightening knot. Spokane rents are rising. The vacancy rate is whisper thin. And the average renter is putting more of her income into housing than in years past. And for many of the poorest residents of the city, finding an affordable place to live is a lottery-like long shot. All of which has intensified in the past few years, and not just among rentals. Housing affordability for buyers has taken a drop as well. For the longest time, cheap housing was one of our calling cards. One of our main civic bragging points. But our affordability was always more than an economic amenity for the middle class – it was the reality of a market composed of a high percentage of people living in or near poverty. That hasn’t changed as housing has gotten more expensive and incomes have stayed flat. We need more affordable, accessible housing, and we need it inside the city limits, and that means, symbolically, that we need it where a lot of us don’t seem to want it: next door. And that means we probably need new ways to have the fights that inevitably arise between neighbors and developers. The city has been working on a range of proposals for several years. A mayoral task force formed in 2016 proposed a package of possible changes to development regulations and policies, some of which have been adopted and others of which are still being considered. The issue of tenants’ rights in the face of steep, short-notice rent hikes came up before the City Council this week – an important issue in a market where landlords hold all the cards. But if we are going to address affordability, which is a supply problem, then builders have to build somewhere. That almost inevitably means next door to someone – to someone who may only want homes next door that have the same kind of roofline as theirs, say, or who can’t abide a duplex or smaller-lot development. Someone – like a certain number of the South Hill liberati – who supports density as a civic-planning principle, but not necessarily, you know, right here. So, even as the City Council considers adding new rules and incentives to encourage “in-fill” development in the city, the downstream reality of that discussion is: If Spokane wants to become more neighborly toward those who can’t afford housing, we’ll have to be more welcoming to developments that bring in new neighbors. 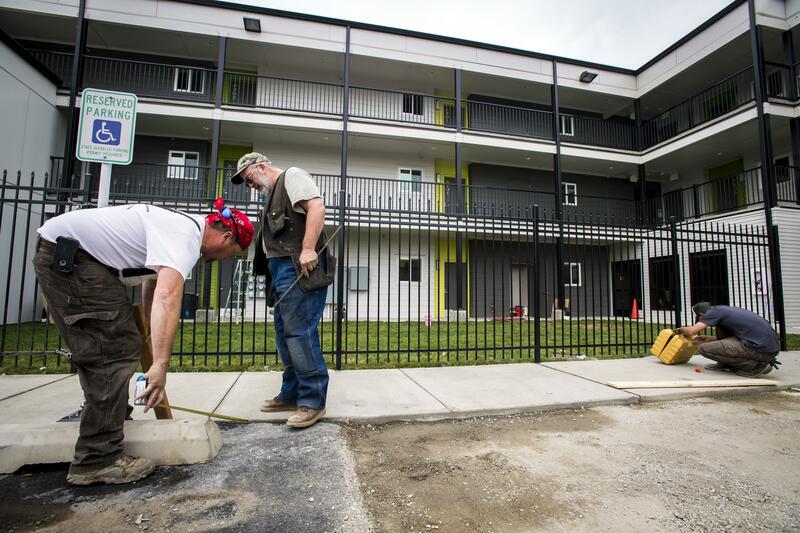 “It is very difficult to get some of these (housing) projects through that would be very beneficial,” said Michael Cathcart, the executive director of the business advocacy group Better Spokane and the former spokesman for the Spokane Home Builders Association. Among many challenges facing builders in a town without lots of open land, Cathcart said, the resistance in neighborhood organizations to growth is among the most significant. And he noted that even pro-growth changes that don’t seem to directly address affordable housing – such as allowing taller buildings next to the park – can help by expanding the overall housing supply, he said. SBHA spokesman Arthur Whitten said his organization has been working on regulations that might provide some exemptions from parking regulations – which he says are better suited for suburban developments than denser cities and neighborhoods – for some multifamily projects in neighborhoods. He and Cathcart prefer incentives such as tax abatements over requirements to adding affordable housing to developments, and they naturally favor more leeway for developers. Of course, lots of neighborhood advocates and others are wary of yielding to calls for unshackling developers, who sometimes seem to work just as hard trying to get around neighborhood concerns as addressing them. But with the crisis in rentals and affordable housing – the apartment vacancy rate has been fluttering between 1 percent and 3 percent in recent years – there is agreement on the pressing, basic need for more housing. A community assessment put together by Spokane Neighborhood Action Partners for 2016-18 paints a grim picture. A rising proportion of Spokane renters (45 percent most recently) spends more than 35 percent of their income on rent. A hypothetical family of four earning the median income here would have to spend 66 percent of their income to rent a three-bedroom home. Among the very poorest households, there are 12 available housing units in Spokane for every 100 people who need one. The SNAP report concluded it would take 300 years to close this gap in Spokane. “We’re not building fast enough,” Councilwoman Kate Burke said. Burke said the affordable housing crisis, and the city’s tendency to resist new forms of developments next door, are forms of growing pains. “We definitely have a town mentality in Spokane, and we’re not a town anymore,” she said. In the near future, the City Council will take up proposals to make changes to in-fill development regulations on multifamily units in the city; these come on the heels of revisions for single-family homes. The multifamily changes would allow taller and larger buildings on lots, among other things. In terms of the Spokane housing market, this is just one small piece of a mammoth pie. It won’t, in and of itself, “fix” things – that will require lots of different efforts, from government and from developers, and will take a long, long time. But the new in-fill proposals, with the way they pit the aims of density against neighborhood protection, zoom to the heart of the matter. We’ve got to look next door for solutions. Published: June 8, 2018, 5:30 a.m.